Born in Iserlohn, Germany, Ingo Rademacher was 10 when his parents moved the family to a goat ranch and vegetable farm in New South Wales, Australia. After four years, they settled in coastal Bundaberg, Queensland, where he attended Kepnock State High school. Rademacher was the lead singer in his high school band and recorded a single, “Life’s a Party,” after winning a local battle of the bands contest. He attended the University of Queensland (Brisbane) but dropped out after six months and began a modeling career in Sydney. He then transitioned into acting, playing a surfer in the Australian soap PARADISE BEACH. Rademacher then moved to America to seek his fortune in 1994. He auditioned for THE CITY but then-GH Executive Producer Wendy Riche saw his tape and immediately hired him at GH. He left the soap in 2000 after landing a role on the Aaron Spelling night-time sudser TITANS, but returned the following year after its cancellation, and despite a number of lengthy vacations, has remained in Port Charles ever since. Was a champion skier at age 8. Jax was originally brought onto GH as a love interest for Lois, not Brenda. That changed when Rena Sofer (then-Lois) announced she intended to leave the show. Appeared on Vanessa Marcil Giovinazzo's INTIMATE PORTRAIT. Has participated in several Ironman Triathlon competitions. Has appeared on the cover of Playgirl twice. Check Out This #TBT Interview With Ingo Rademacher From 2001! 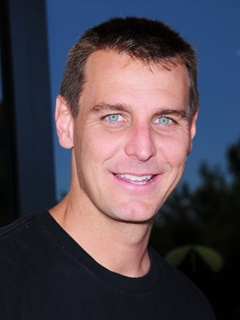 Ingo Rademacher Back To GH!